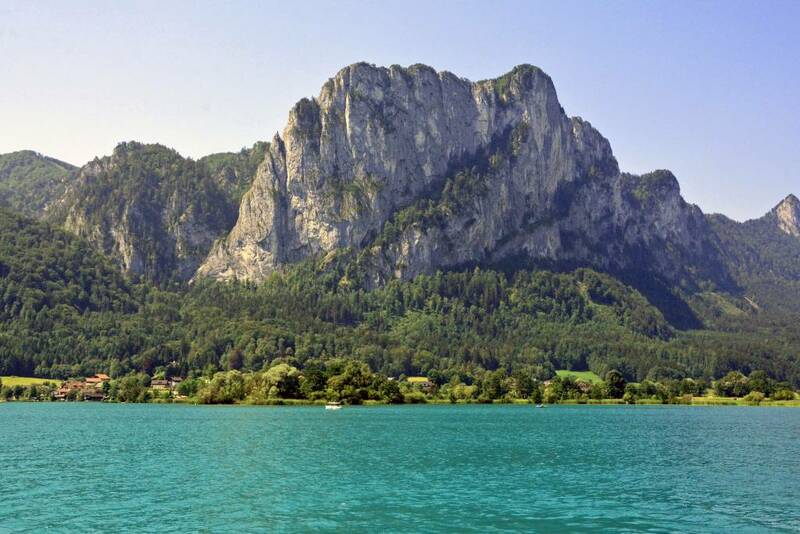 Lake Mondsee is one of 76 lakes within the beautiful Salzkammergut region of Austria. Its crystal clear turquoise water surrounded by magnificent karst peaks sets a picturesque scene. 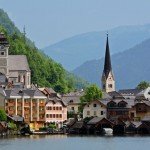 The nearby towns of St Gilgen, Fuschl am See, Bad Goisern, and Hallstatt are also definitely worth a visit in this stunning region not too far from Salzburg. 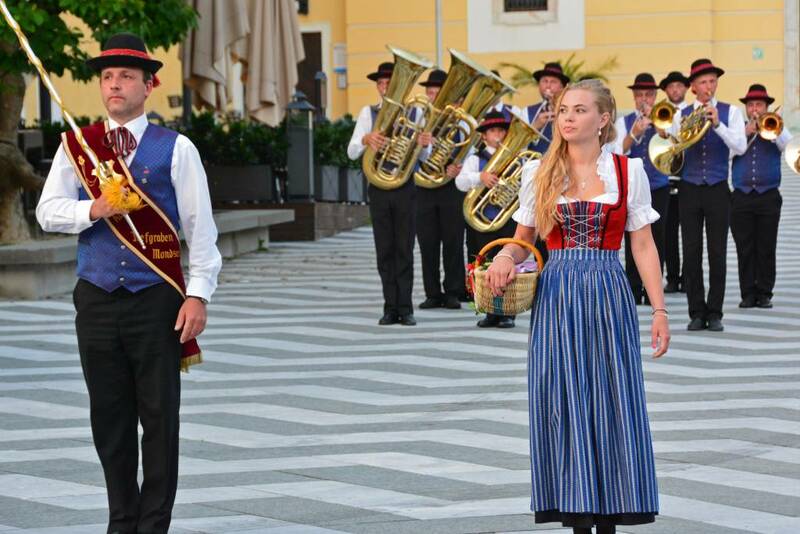 Mondsee Austria is another town you’ll definitely want to put on your list… especially if you’re a fan of the Sound of Music! It’s no wonder that this stunning backdrop has made Mondseeland the go-to wedding destination for the region, with over 400 weddings taking place throughout the year! 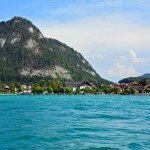 What Mondsee Österreich (Austria) may be most famous for is the Basilica St Michael, where the wedding of Maria and Captain Von Trapp took place in the world-famous musical, The Sound of Music. Are you a fan of the Sound of Music? Check out this popular tour in Salzburg which takes you throughout the city and into countryside where you’ll visit locations used in the film, all while listening to the original soundtrack. 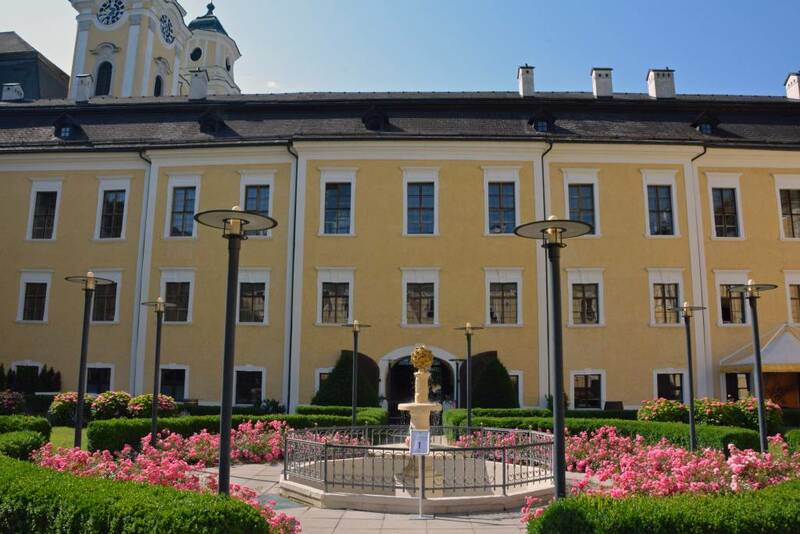 True Sound of Music fans can even stay at Hotel Schloss Leopoldskron in Salzburg, which served as the Von Trapp Manor. 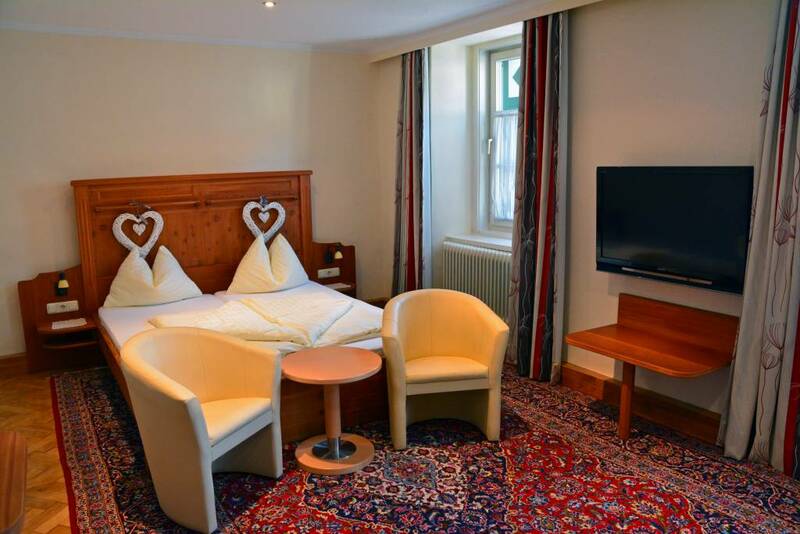 Check availability and current prices at Hotel Schloss Leopoldskron. What we learned on our informative tour of the town was that although the movie wedding took place inside the Basilica St Michael, the outside of the church was never shown in the movie, as it was under renovation. The church where they originally wanted to film the wedding had renovations going on inside, so only the outside of that church was filmed. Together they created the wonderfully famous movie wedding scene. 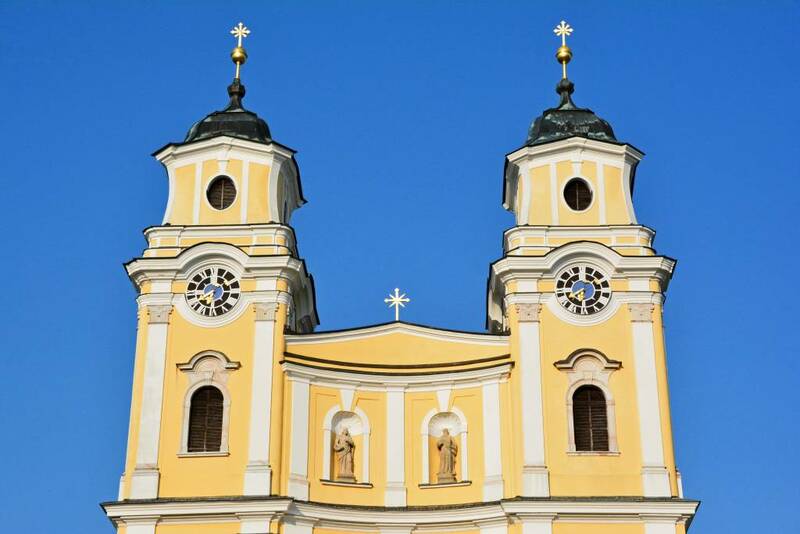 This church has a deeper, richer history than its appearance in the Sound of Music. 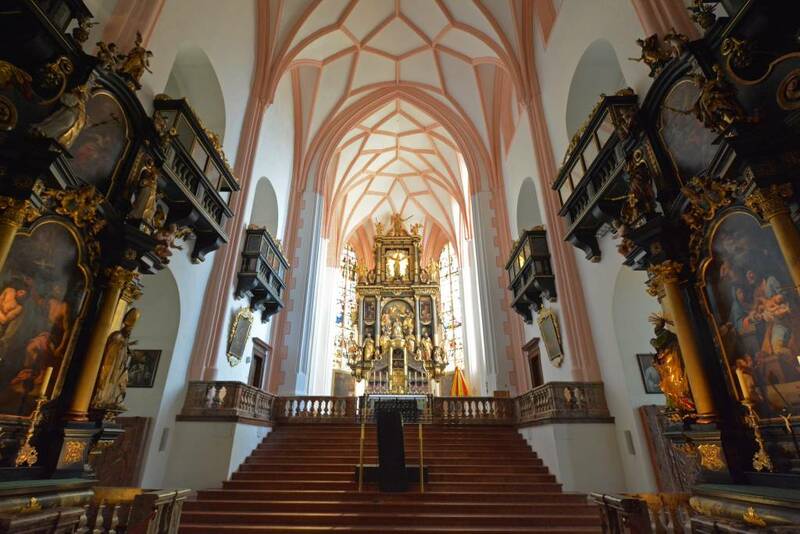 What began as the Mondsee Monastery in the year 748 was destroyed and rebuilt over the centuries with the addition of the collegiate church in the 16th century. The Baroque-style altars collaboratively created by Meinrad Guggenbichler and Matthais Wichlhammer are nothing short of extravagant. 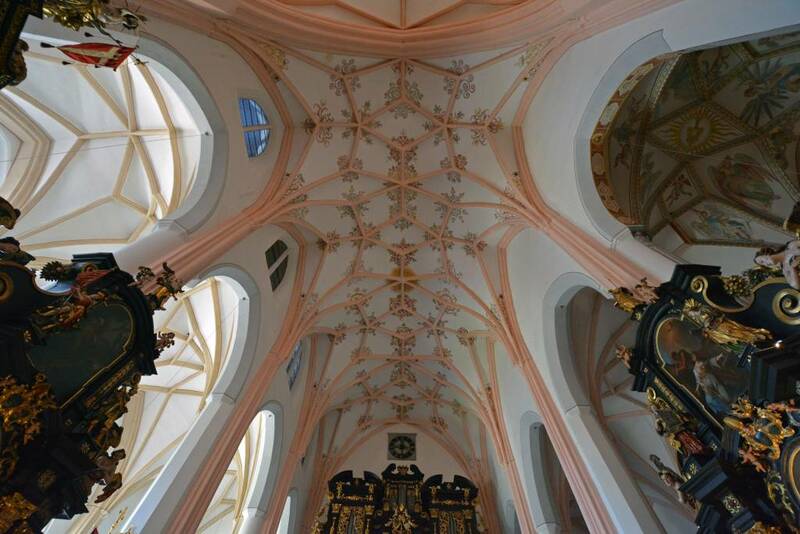 The framing on the Gothic vaults have been painted in the original light pink color discovered during one of the many restorations. The restored monastery has been turned into a classy hotel where history has been preserved and where style is of the essence. 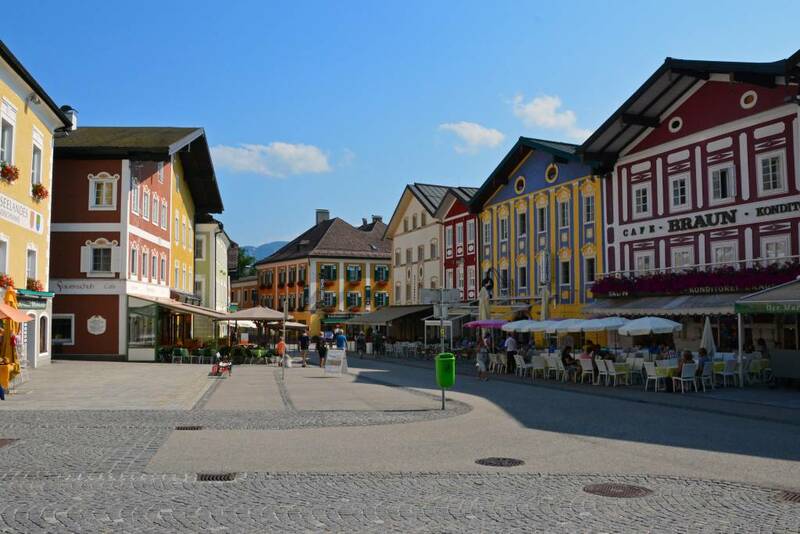 So, even if you’re not looking to ‘get hitched’ or you’ve never even seen the Sound of Music, we’d still recommend a visit to the quaint and colorful town of Mondsee Austria. The main square is no bigger than 2 blocks with an ample selection of cafes and restaurants to choose from. 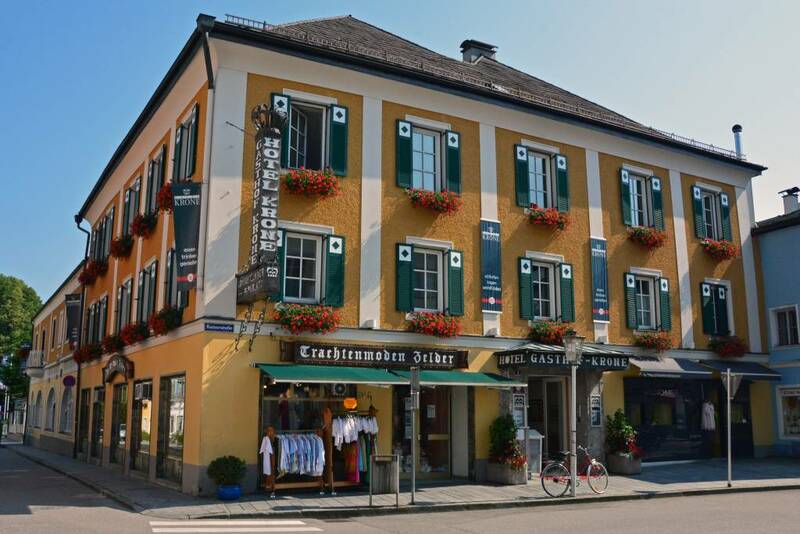 We stayed one-night in Hotel Krone Mondsee. Its convenient location had us within a stone’s throw of the town square and within easy walking distance of the lakefront. The room was comfortable and adequate for our all-too-brief stay. 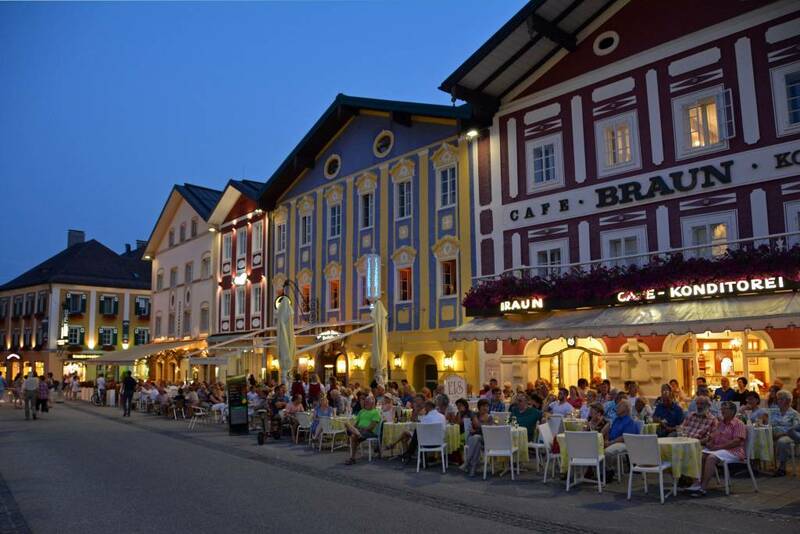 The great thing about Mondsee Austria is that there is always something going on, especially in the summer months. 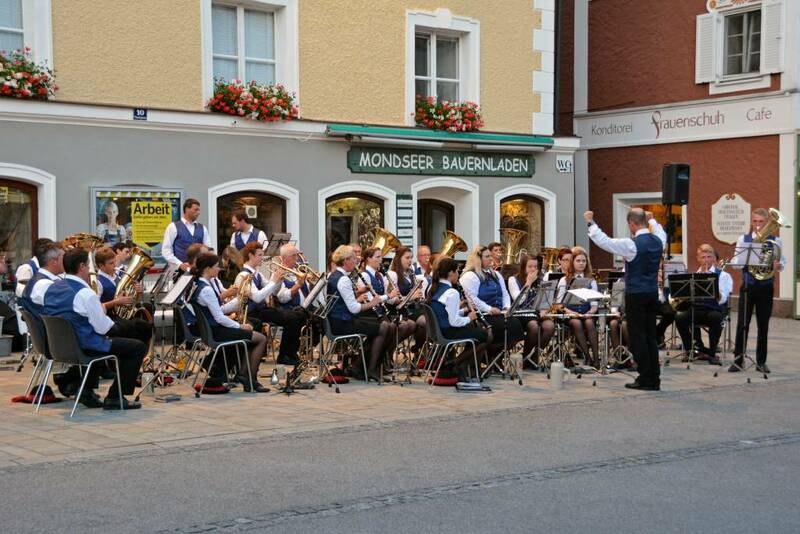 On the evening of our stay, a local marching band marched right into the main square and performed for the town! Those who happened to be dining outside at one of the many restaurants were front and center for the wonderful (and free) 2-hour concert. In the winter months, Mondsee has a notable Christmas Market not to be missed with scrumptious local delicacies (think mulled wine and roasted chestnuts) and locally made crafts, such as candles and woodcarvings. 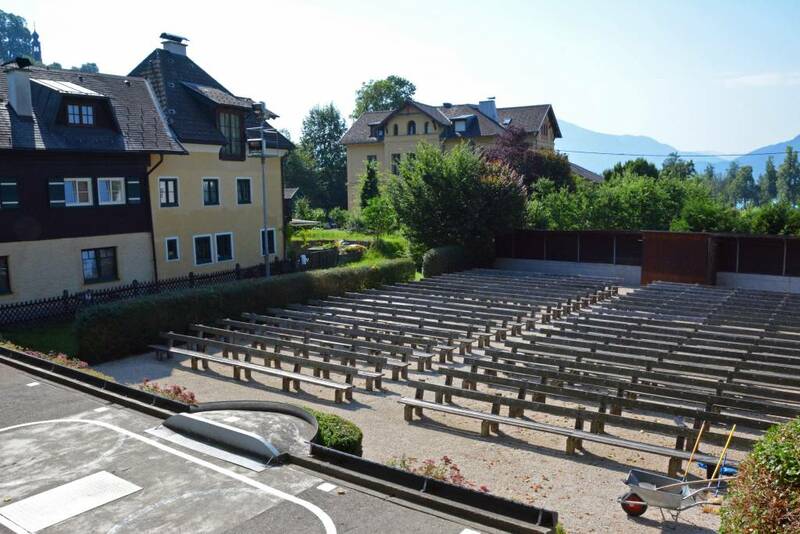 Other summer events include the Mondsee Jedermann performance which has been held in the Karlsgarten Gardens as an open-air play ever since 1922. 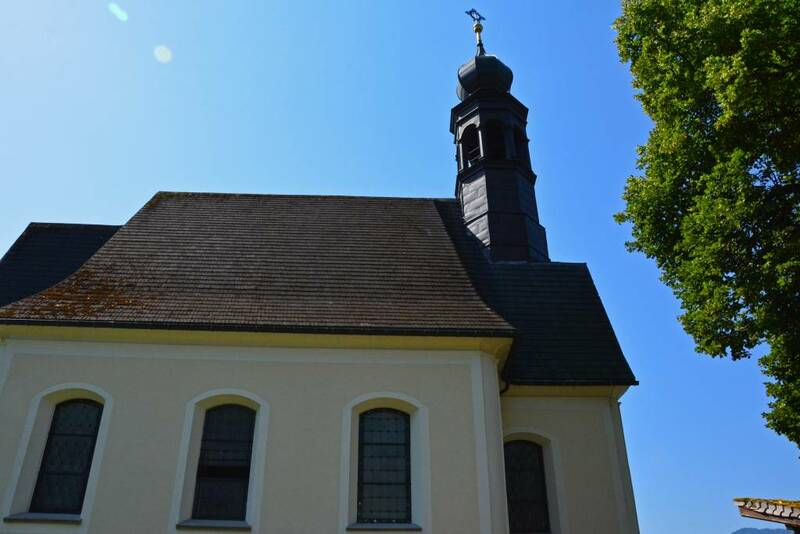 Hilfbergkirche (Hilfberg Church) was built in 1449, with the interior of the chapel created in the workshops of Meinrad Guggenbicshler, the same individual who constructed many of the altars in Mondsee Basilica. Situated atop a hill overlooking Lake Mondsee, it offers a panoramic view over the bay and the Schafberg and Drachenward mountains. 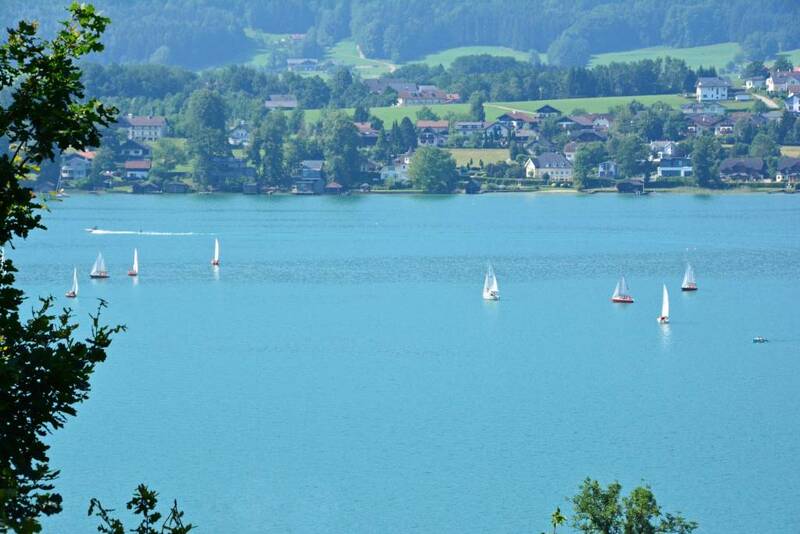 So, now it’s onto Mondsee’s best attraction- Lake Mondsee! 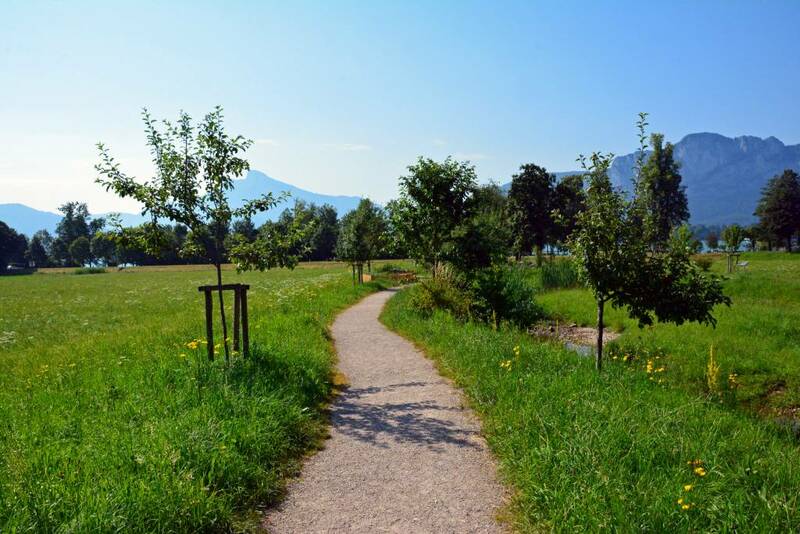 A beautiful nature path leads away from the town centre and down to the water’s edge. The beach area (Alpine Beach) along the waterfront in Mondsee is the biggest in the Salzkammergut region. Here you will find piers, a diving tower, water slides, beach volleyball, and much much more. Sailing, wind surfing, and water skiiing are popular activities on a nice summer’s day. The best way to experience the lake, in our opinion, is to get out on the lake! Besides renting a boat and paddling or sailing around on your own, another great way to get on the water and learn about the surrounding area is to take a sightseeing cruise. 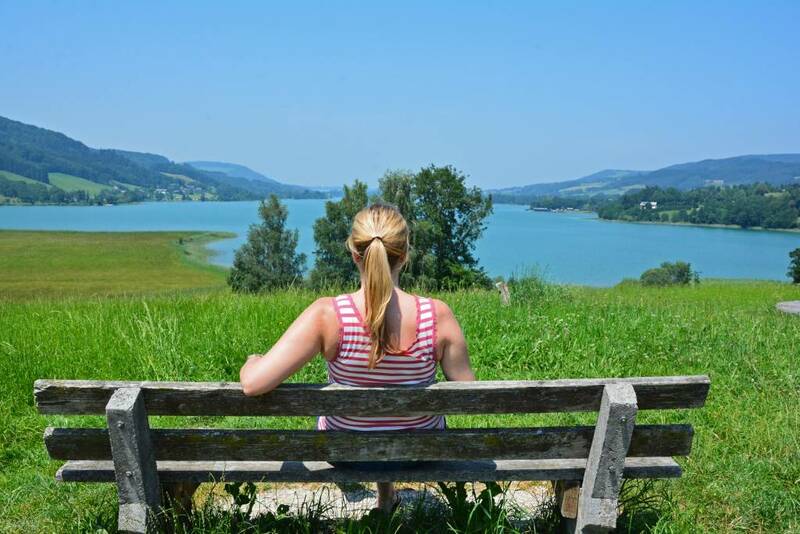 With the warm sun, gentle breeze, and unparalleled views, it was the perfect way to spend an hour of our afternoon in Mondsee Austria. 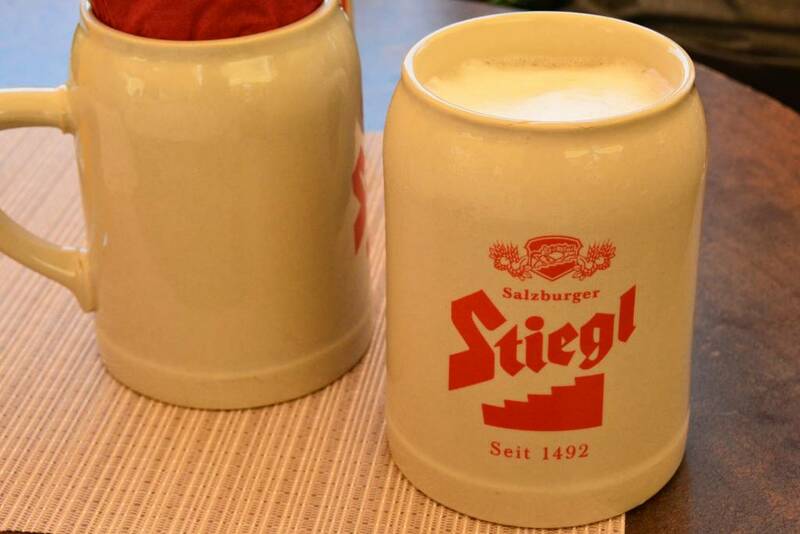 It was an unusually warm summer day when we visited, so a chilled stein of the local brew – Stiegl – was much needed following our time on the lake! 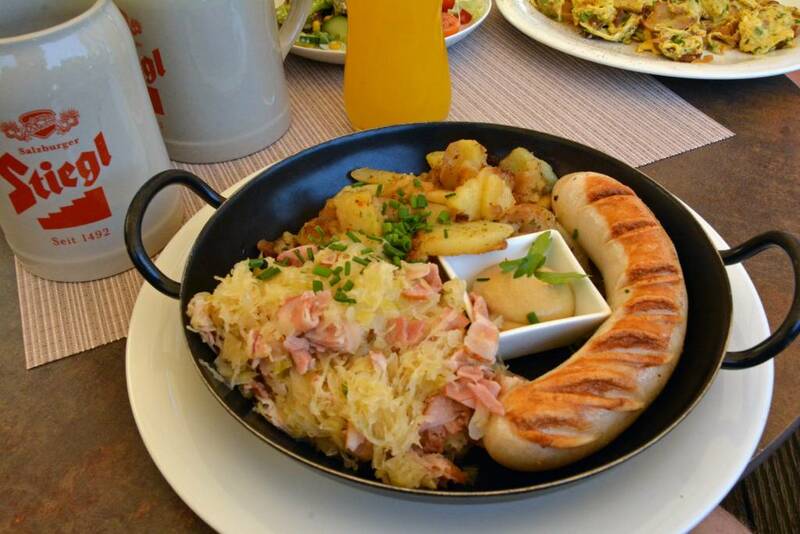 It was a great complement to our authentically Austrian lunch at Schlossbrau at the Schloss Hotel. (Well, I had a caprese salad, as it was much too hot for a warm meal and I’m not much of a meat eater.) Sam, however, devoured his delicious bratwurst and sauerkraut. 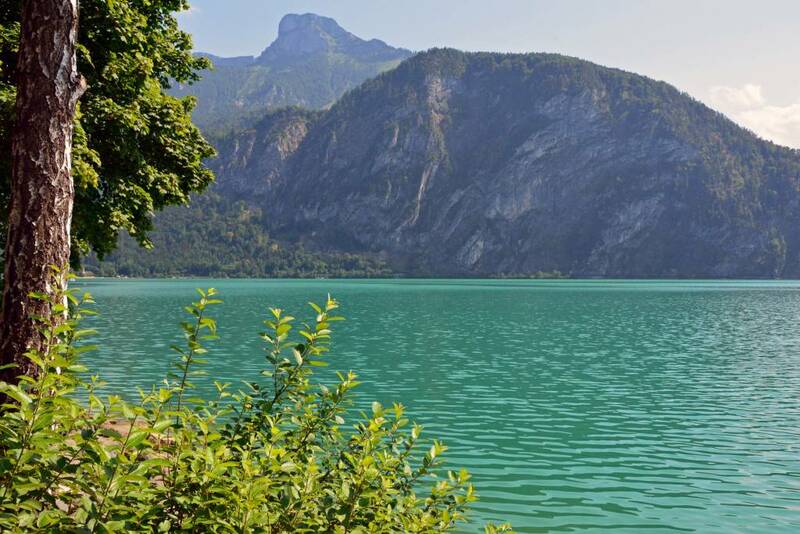 Just 10 minutes away from Mondsee by car is Irrsee (pictured below), yet another beautiful lake with some of the warmest water in the region. 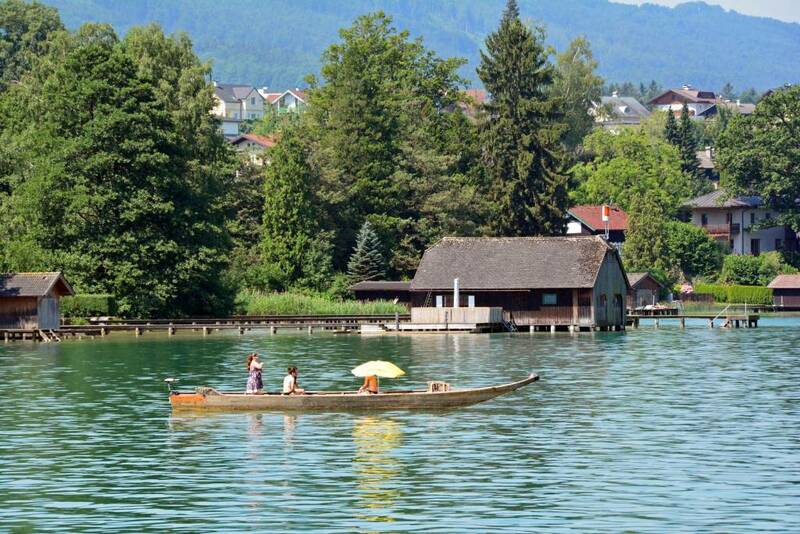 There is no doubt about it, the Salzkammergut region of Austria is one of the most picturesque places on Earth. With so many lakes and villages, there is certainly no shortage of things to see and do. So, whether you’re a Sound of Music fan or just a fan of beautiful small towns, mountains, and lakes, be sure to visit this region on your next European holiday! The distance from Salzburg to Mondsee is just a quick 30 minutes. This post contains a few affiliate links, which simply means if you click on one of our links and make a booking, we may receive a small commission. Sounds like a fab place to be in the summertime. Great photos too! The town looks like it could be a movie set – a little surreal. Thanks! The water color is simply AMAZING in the sunshine! The day after we left, there was some rain, so we timed our visit just right! Random person here doing a google search. 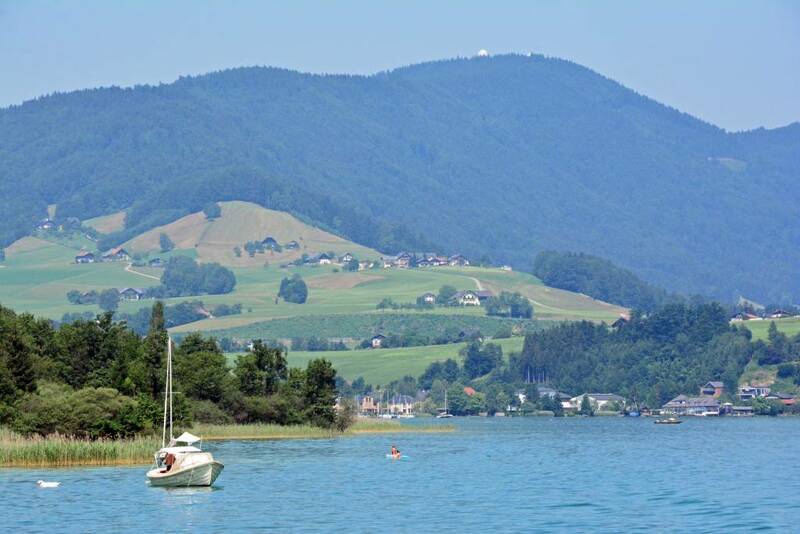 Looking to stay in Mondsee this summer for a few nights while I see the Salzkammergut. 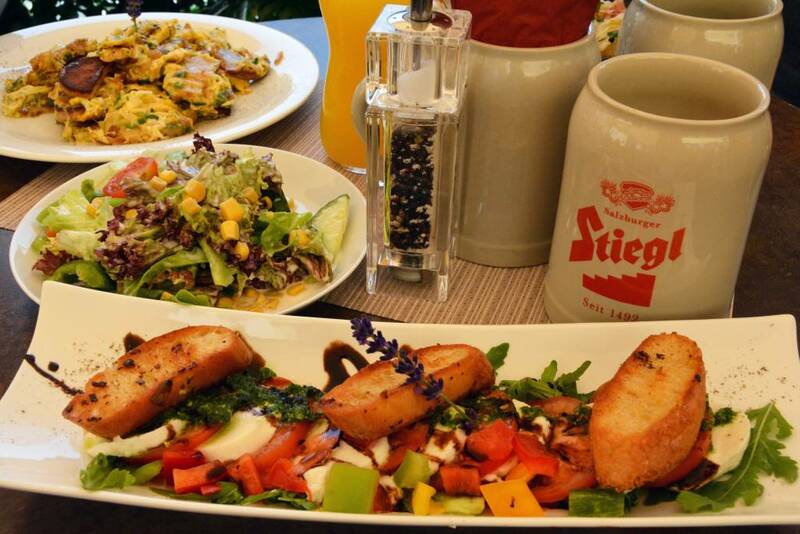 Do you recall the cafe/restaurant with the Steigl beer, bratwurst and sauerkraut? Beautiful photos. Glad you had fun and I’m excited. Danke! 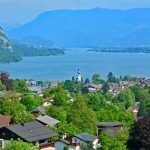 As a native Austrian and fellow travel blogger, I really enjoyed reading your blog about Mondsee and the many beautiful snapshots. Well done. Wonderful! So glad you enjoyed it! 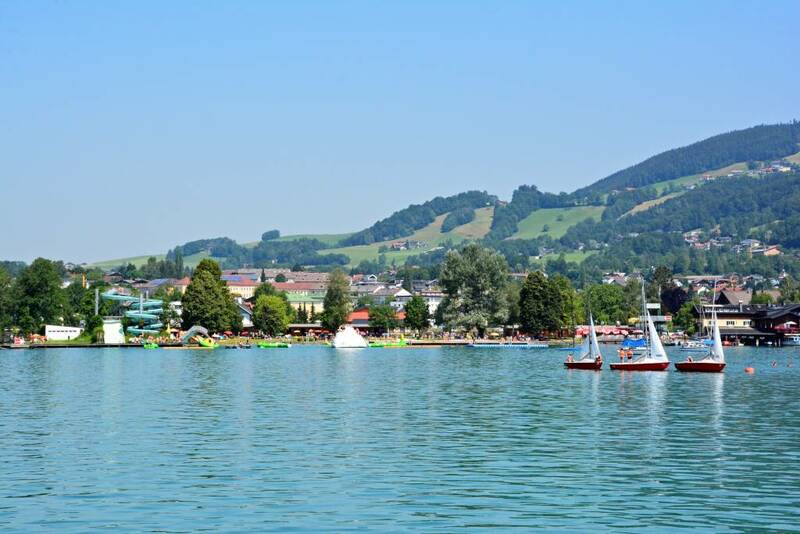 We really loved Mondsee, and Austria as a whole! Can’t wait to get back and explore some more of your beautiful country.